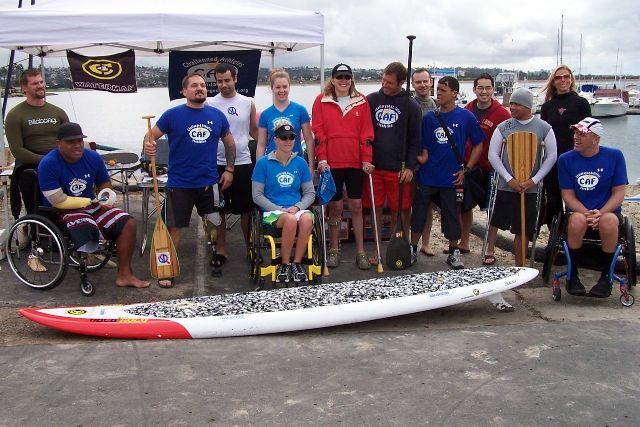 C4 Waterman ambassador Ryan Levinson joined forces with paddleboard retailer Aqua Adventures and members of the San Diego Outrigger Canoe Club to host an inspirational paddleboarding and outrigger canoe clinic for disabled athletes. The event was held in support of the Challenged Athletes Foundation and CAF’s “Operation Rebound” program. Fifteen challenged athletes, veterans, troops, and first responders enjoyed paddling an armada of C4 Holo Holos and Classics in Mission Bay, San Diego. Only 5 days ’till the 13th Annual Hanohano Ocean Challenge. 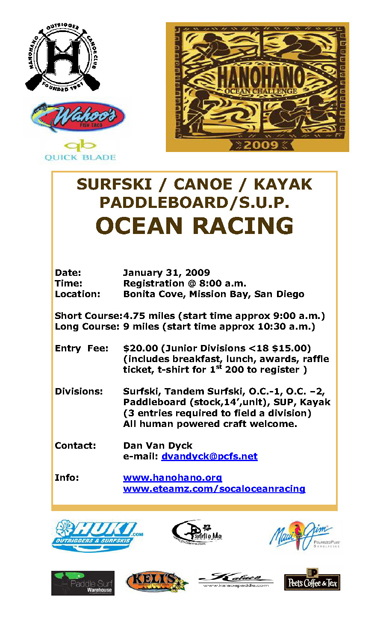 More info on the Sponsors and race day happenings can be found at: www.hanohano.org. Here’s an update on the Hawaii Kai C4 Waterman and Wet Feet Demo day. Saturday January 31 – Demo day @ Hawaii Kai with Wet Feet. at the Hawaii Kai boat ramp from 10:00 am till 1:00 pm. from 10:00 am till 1:00pm. C4 Waterman and Wet Feet are teaming up so you can try Stand Up Paddling. Expert tips, equipment advice and water etiquette from Hawaii’s leading watermen Brian Keaulana, Dave Parmenter and Todd Bradley. Free of charge just bring your valid I.D. Top Menu Change – Any Suggestions? After some discussion, we made some changes on the navigation menu of the site to hopefully make things easier to find. We just changed the order of the top menu links and nothing was deleted. Please send us comments or suggestions on what you think. Aloha. If you spend time at www.standupzone.com then you’ve probably seen posts by Rambo from http://rambos-locker.blogspot.com. I was watching this video and it gave me a first person view of exactly what the feeling is like to connect open ocean waves (bumps). You’ll see in Rambo’s video how he turns his OC-1 canoe to line up and catch the next bump. This is what people are always talking about and the super fun part of downwinders that I enjoy. Join us at the Hawaii Kai boat ramp on Saturday January 31st. from 10am till 1 pm. an independent non profit organization whose mission is to promote SUP distance paddling, SUP etiquette, and SUP community service events. Here is an update for this Saturday’s SUPAH Distance Paddling clinic from Jeff. Zane Schweitzer 15 years old, Born and raised on the West side of Maui. Attends 9th grade at Maui Preparatory Academy High School. Sponsors: Starboard, Maui Jim Sunglasses, Ion Wetsuits, Genr8, North Sails, Quicksilver Boardriders Club and SurfCo Hawaii. Honolulu, HI, January 15, 2009: After a brief hiatus, the Hawaiian Longboard Federation (HLF) regroups to offer membership and ratings points for both longboarders and Stand-Up Paddlers (SUP). As a third party entity, the HLF will not coordinate events but rather give points based on competitors results from other established contests held in Hawaii and across the nation. Arguably one of the best sports catalogues ever produced. 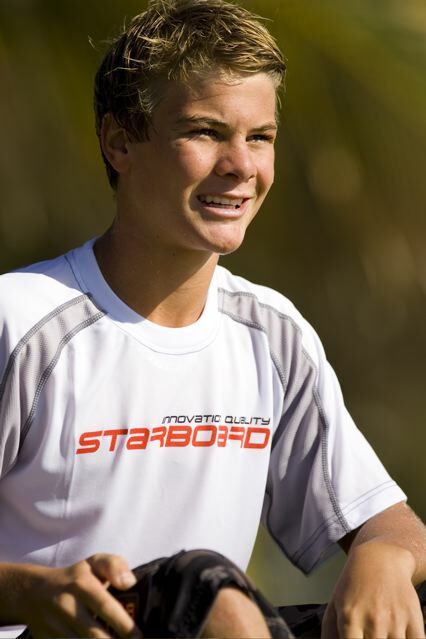 The 2009 Starboard SUP catalogue is being launched today, Thursday the 15th of January. A journey of images by our international Dream Team across the globe, taking SUP to another level. Our mission statement; Searching for water and finding the world, definitely shows that SUP is for everyone everywhere anytime! (Huntington Beach, CA) January 14, 2009 — Quiksilver is pleased to announce that the holding period for the second annual Quiksilver Premium Ku Ikaika Challenge, sponsored by C4 Waterman, will commence tomorrow, January 15, through February 28, 2009. It is possible that the event will run immediately, given the current long-range forecast for large to extra-large surf that will coincide with the onset of the holding period. 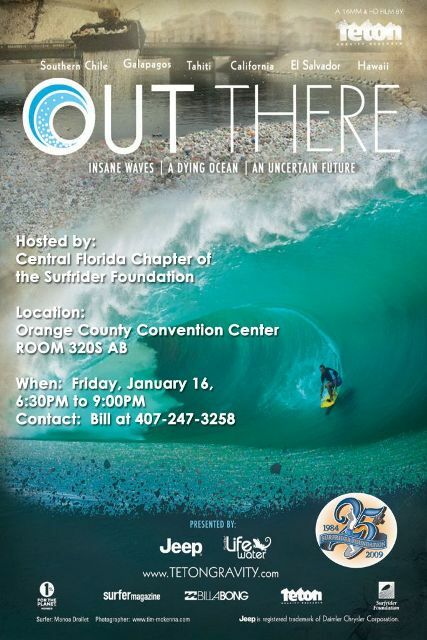 Werner Paddles will make a check presentation to the Surfrider Foundation at the Surf Expo Trade Show in Orlando Florida the night of January 16th. Werner Paddles supports several non-profit partners, including the Surfrider Foundation, through its Healthy Waters Initiative. 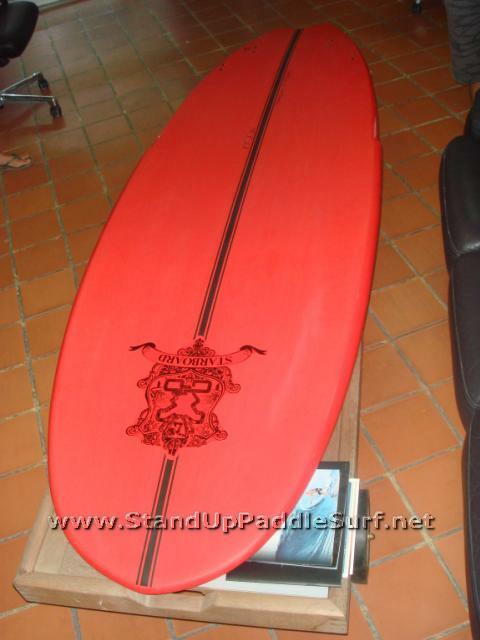 You are currently browsing the Stand Up Paddle Surfing in Hawaii - StandUpPaddleSurf.net weblog archives for the month January, 2009.